On a scale of "Contender to be in Oprah's Book Club" to "I would use this as kindling for a campfire" -- if I wrote a book about Houston restaurants/bars that have cocktail onions, how do you think it would stack up? 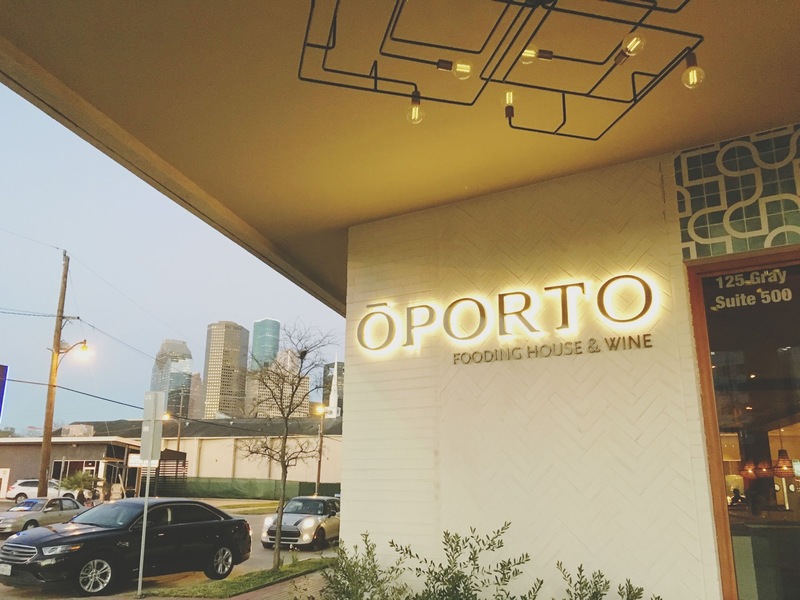 A couple of weeks ago, I got together with my #yogidinnerclub gals Kate, Danielle, Francis, Jill, and Val for some drinks and bites at Oporto Fooding House & Wine, a restaurant located in Houston's midtown area. Oporto Fooding House was created by the same geniuses who brought us the original Oporto Wine Cafe, as well as Queen Vic. Needless to say, I was pretty pumped to try this Houston restaurant out. This was my first experience dining out in Houston as a vegan, so I called ahead to give them a heads up, and also to make sure I'd be eating more than just a few lettuce leaves that night. 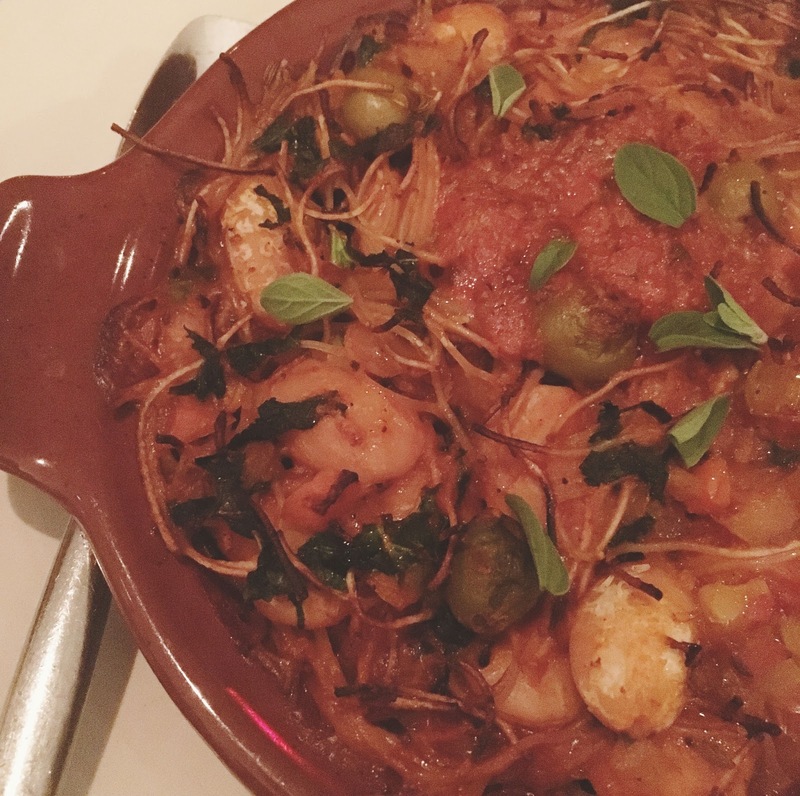 The kind woman I spoke with on the phone assured me I was in good hands, and said I absolutely had to order the feijao con fideos, without cheese. Before ordering a carafe of wine from their WINE ON TAP (don't ever wake me from this dream), I nervously asked if they had cocktail onions. (I think you know how this story turns out). 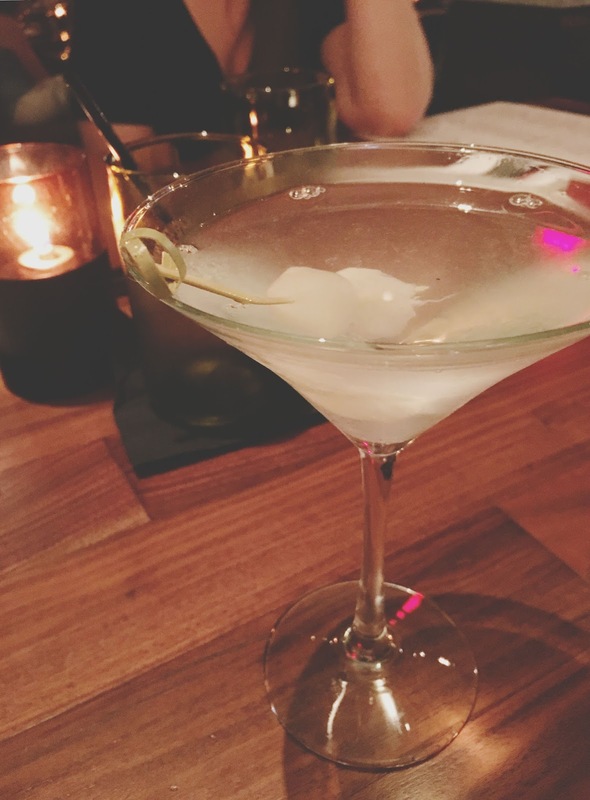 SO I was able to enjoy a dry, delicious, blissful, onion-y martini/gimlet at a Houston restaurant! 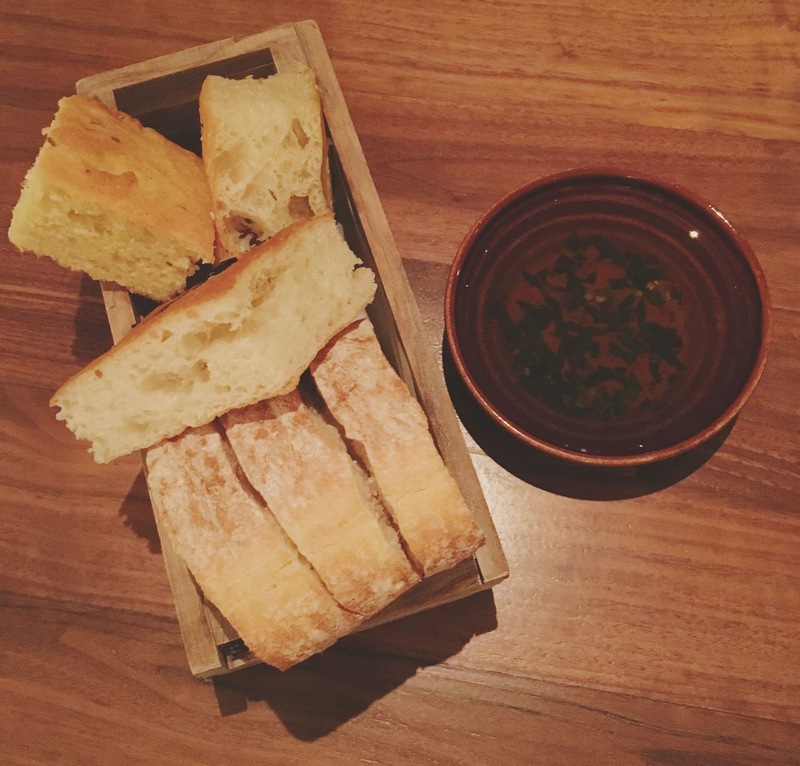 Oporto's menu is made up of food items that are meant to be shared, so we started off with an order of the daily bread. The assorted bread (focaccia, I believe, and another kind of loaf) was fresh and fluffy. The herbed olive oil served with it was silky and fragrant. It was a nice way to start everything off! Our next order of food was the batatas. 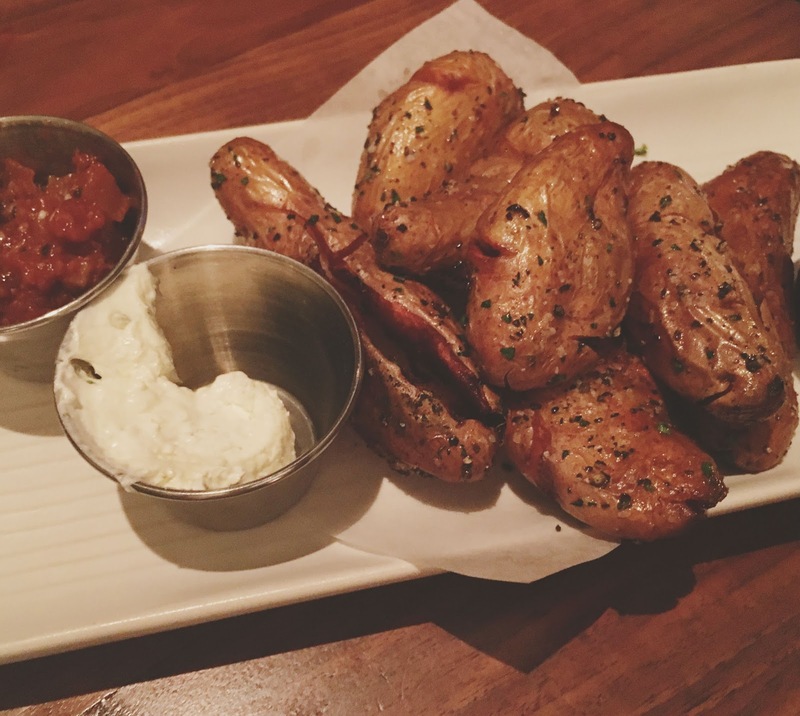 Beautifully golden fingerling potatoes were lightly coated in fresh herbs and course salt, and served with a side of tomato chutney and garlic aioli. The chutney added a nice, bright, contrasting acidity to the potatoes. This was a hearty, tasty, and comforting dish. If I see shishito peppers on a menu, I have to order them. So shishito peppers it was for our next round of food! 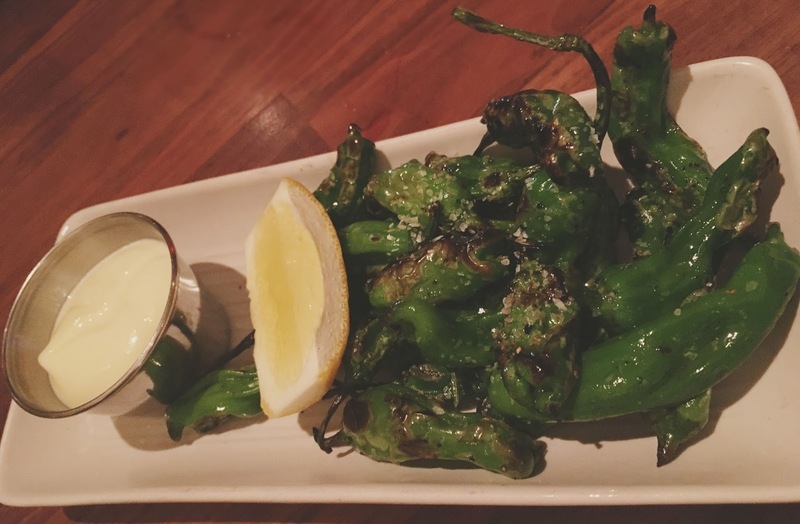 Listed as "pimentas" on the menu, the wood-grilled peppers were served with a side of garlic aioli and seasoned with course salt. A squirt of lemon perked them up a little more, and all in all this was a standard, good offering of shishito peppers. 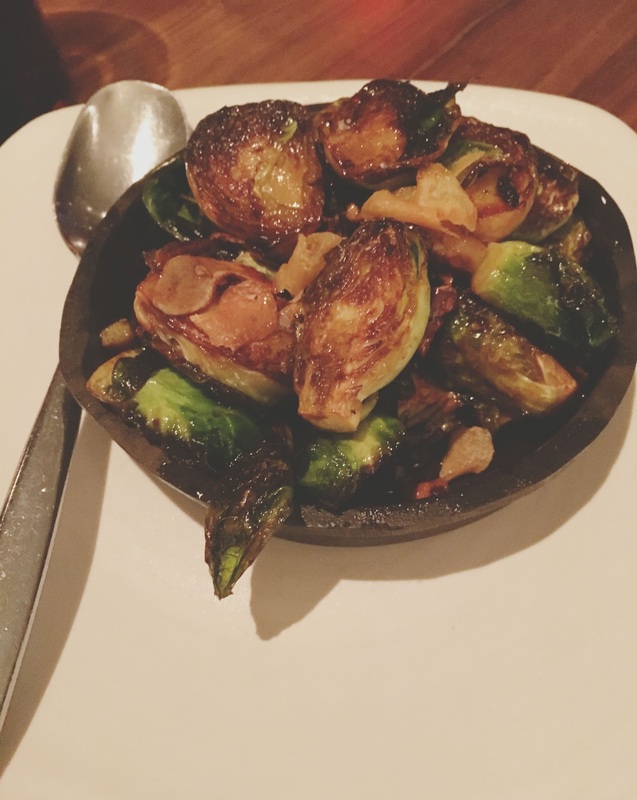 The restaurant's brussels sprouts were slightly vinegar-y and beautifully caramalized. Once again, this was a standard, delicious offering of a dish, and once again, we weren't disappointed! The final two food items I indulged in (my friends also ordered some additional meat- and fish- based dishes that they loved) were my favorites of the evening. First up: the charred veggies. 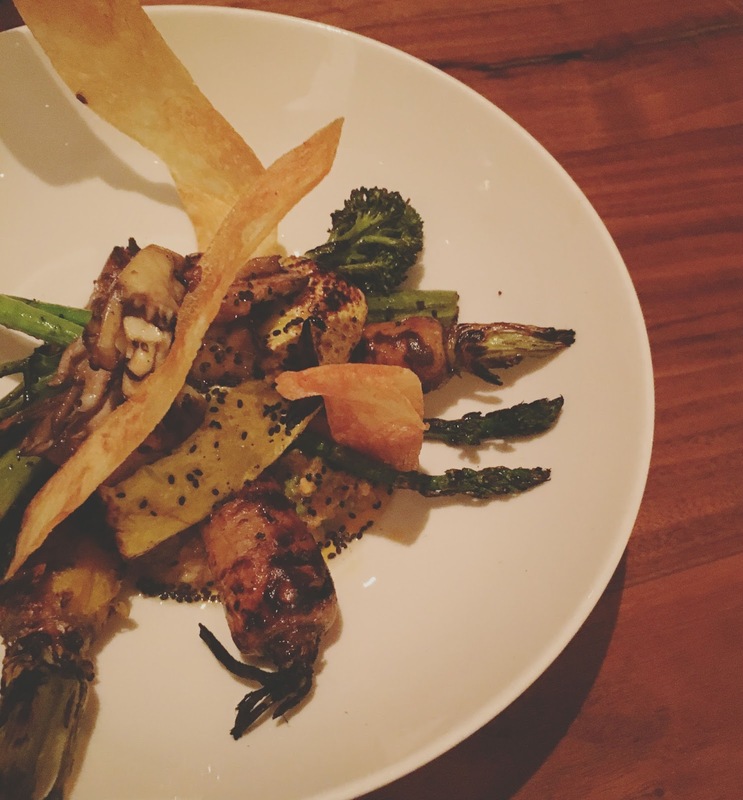 Wood-grilled vegetables were tossed in a pistachio romesco sauce and chili oil, and topped off with basil seeds and potato crisps. The dish normally comes with aged goat cheese, but I requested it without, to make it vegan. And it was wonderful. The root vegetables were so meaty and mouthy, I was convinced an oyster mushroom was meat! (it was, in fact, a mushroom). This was another great winter dish, and I was very pleased with the different flavors from the filling, earthy, smokey vegetables in front of me. The final food item that I tried was what the woman on the phone recommended - the restaurant's feijao con fideos, aka bean stew, without feta. This piping hot dish was intricate, varied, and FASCINATING. Hearty gigante beans swirled in a mixter of wilted kale, delicate fideo pasta, green olives, garden fresh oregano, and a light almond romesco sauce. The textural contrast of the bursting beans and subtle (and on occasion slightly crisped) noodles was a force to be reckoned with. The sauce was ripe and citrus-y, and it balanced SO well with the base ingredients. I adored this dish! Oporto Fooding House is a wonderful compliment to Oporto Wine Cafe. And - as evidenced by yours truly - the menu offers a wide variety of different food items that can accommodate even the most tricky of diets. 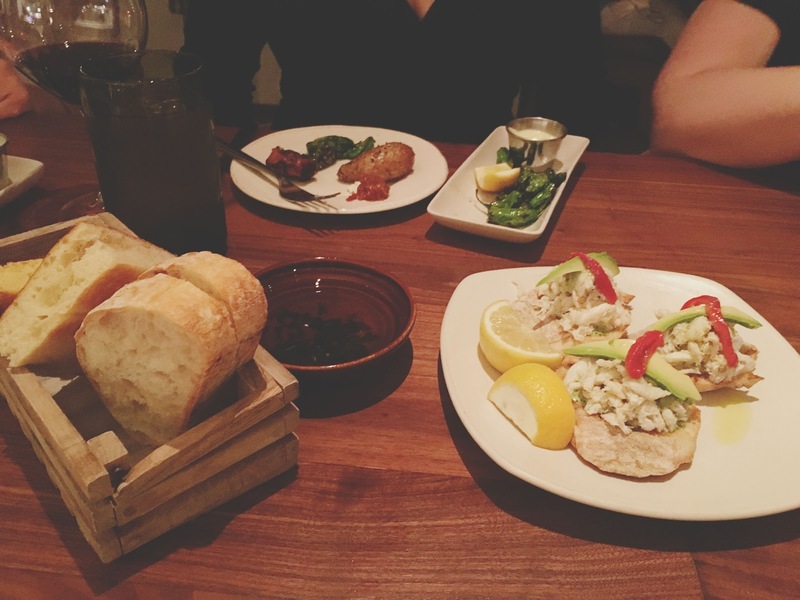 This Portuguese-inspired restaurant and bar is a fantastic spot for great food, great drinks, and a fun night out with friends! 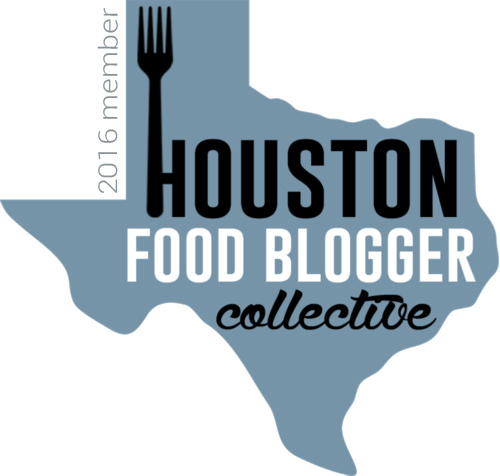 Stay tuned to hear more about the future New York Times Best Seller, A Girl and a Cocktail Onion: One Woman's Journey to Finding Pickled Love in Houston. I want in on the next "yogis eat yummy food" fun outing!! !